Pollo Pibil is another classic meal in the Yucatan peninsula, a true gastronomic jewel! The main ingredient in this dish is the Achiote paste, also known as “Recado Rojo”, an essential ingredient and the base of many dishes in Yucatecan Cuisine. These dishes include the famous Cochinita Pibil and the Mucbi-Pollo, a large tamal prepared for the Day of the Dead. The Achiote (Annatto) tree grows in tropical and subtropical weather in different regions of the world. The seeds are used as a natural colorant and seasoning, or as a part of home remedies, but it is also used to give color to cosmetics, paint, varnishes, and textiles. In the kitchen, it gives color and seasoning to dishes like rice, soups, broths, atoles, meats, fish, and sausages, besides other cold meats. The above picture shows the Achiote seeds, now easily available via online stores or at Latin-Caribbean markets, but the Achiote Paste/Recado Rojo is the one we’re using for this recipe since the paste is already made. While living in the southern Mexican state of Tabasco, I learned how to make the paste from my hosting family. I will write about that in another post. 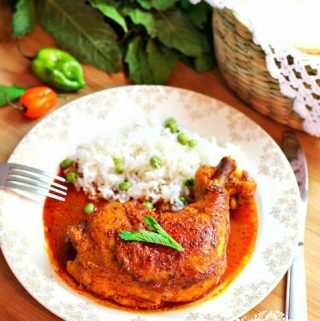 Place chicken in a large glass bowl and cover with the Achiote sauce. Marinate for at least 1/2 hour in the refrigerator. Arrange the banana leaves or aluminum foil, cutting them into squares ready to assemble the chicken packages. Prepare a steamer pot or a large Dutch oven with a lid to cook the chicken. Place one piece of chicken in the center of the banana leaf, spoon on some of the marinade sauce, and garnish with a slice of tomato, some slices of onion, 1 epazote leaves, and 1 small roasted garlic. Season with salt and pepper. Wrap the chicken into rectangles, like when wrapping tamales. You can either use only aluminum foil for this step, banana leaves, or both. If you are cooking the chicken with a steamer pot (tamalera), just add warm water to the bottom without it getting the rack. If you are using a Dutch oven or large pot, make a bed at the bottom of the pot using banana leaves or aluminum foil. Add 1 cup of hot water and place the packages inside the pot evenly. Cover with banana leaves or aluminum foil and place the lid on top. Cook for about 12 minutes on medium-high heat and bring to a boil, then reduce to a low simmer and cook for 30 more minutes. 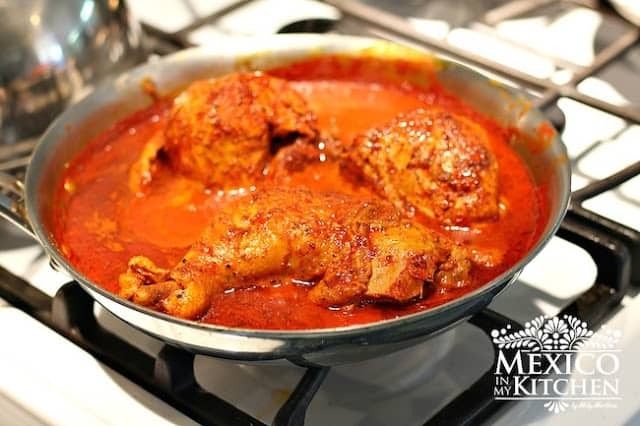 The easier version requires only to place the chicken pieces in a large casserole and cover with the achiote sauce, cover and cook for 45 -50 minutes. To serve, unwrap the chicken, removing the banana leaves or aluminum foil, and serve with red pickled onion, habanero sauce, and warm tortillas. Pollo Pibil is another classic meal in the Yucatan peninsula, a true gastronomic jewel! The main ingredient in this dish is the Achiote paste, also known as "Recado Rojo", an essential ingredient and the base of many dishes in Yucatecan Cuisine. 2 banana leaves**or aluminum foil cut into about 12 X 12 in squares. Place Achiote paste, citrus juices, oregano and cumin in a blender; process until it has a smooth texture. 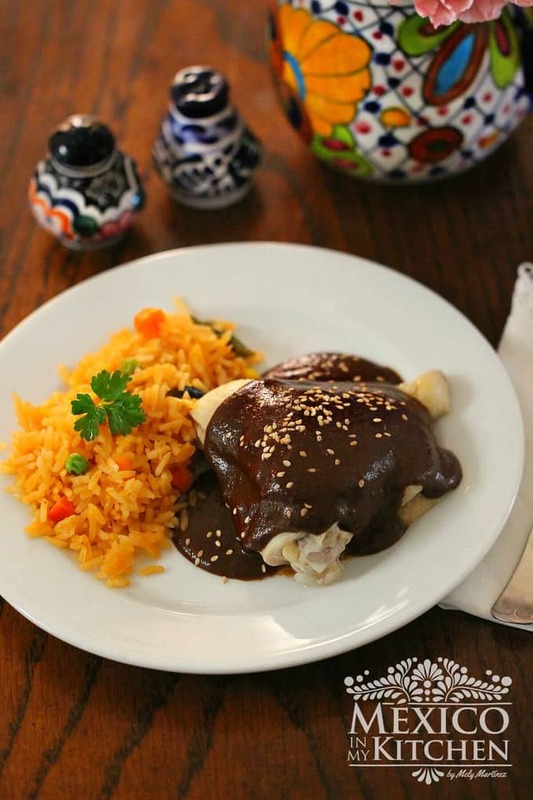 Place chicken in a large glass bowl and cover with the Achiote sauce. Marinate for at least 1/2 hour in the refrigerator. You can also prepare this meal overnight and just cook before dinner. Wrap the chicken into rectangles, like when wrapping tamales. You can either use only aluminum foil for this step, banana leaves, or both. When I find fresh banana leaves, I use only those; when only frozen leaves are available, then I used both since frozen banana leaves break easily after thawing, but still, give flavor to the chicken. Cook for about 12 minutes on medium-high heat and bring to a boil, then reduce to a low simmer and cook for 30 more minutes. Do not let the water run dry, refill to keep the steam going, just be careful when opening and removing the lid, since the vapor can be very hot. To serve, unwrap the chicken, removing the banana leaves or aluminum foil, and serve with red pickled onion, habanero sauce, and warm tortillas. You can also serve with white rice and a salad. The easier version requires only to place the chicken pieces in a large casserole and cover with the achiote sauce, cover and cook for 45 -50 minutes. It will need a little extra liquid. So, add more orange juice or chicken broth. *I usually buy 6 whole chicken legs (instead of the whole chicken) when making this recipe. They’re easier to wrap, have more flavor, and everyone can have the same portion. **Banana leaves are usually sold in the supermarket’s frozen section or in Latin markets. Defrost them and clean with a wet paper towel. To make them more pliable, place them one by one over the stove top flame in a steady and fast movement, they will change to a glossy color and become pliable. Filed Under: Chicken, Lent Tagged With: chicken, Pibil, Pibil Chicken, Pollo Pibil, Yucatan. Mely por qué no pones el ajo sal y pimienta en el adobo? Yo asi lo aprendi hacer cuando vivía en el Sureste, el achiote es el principal saborizante. Pero me imagino que debe quedar muy rico si se le agrega a la salsa. Unfortunately, I don't know of a substitute. have you try to look in your city. I know you live in an Island, but you never know. Thanks for being so loyal to this blog. Can it be cooked in a crockpot? yes, it works just fine in the slow cooker "crock pot". It will take longer to cook but it will be as good as on the stove top. You can also place it in a oven bag and bake in the oven. Hello, I made this dish tonight, I think I followed step by step, for my on laws from Mexico City Thank you. Hello Katerina, thank you for trying the recipe. Hi! Gary from Arizona! I did this in a dutch oven. Laid banana leaves to cover the bottom, then poured the mix in, and topped with tomato, onion, epazote, and garlic. Covered with the "over hanging" banana leaves, and cooked. OH BOY! Wonderful! Thank you, thank you, thank you!!!! Wow! Gary, it sounds so good! Thanks for trying the recipe. Gary again. I have a question. I used "El Mexicano" Achiote Rojo. This seems to be the paste that is used often in this recipe. Have you ever used Achiote Verde? Do you have any recipes where this is used, and can you use it in this one? I have a 5lb. pork roast that I am thinking about using this on, but…??? Your assistance would be VERY welcome. What you find here as "achiote verde" is actually steak seasoning in Yucatan. It is usually diluted with orange juice to season thin steak to cook over a griddle or to fry it. You can use it on the pork roast. Good recipe, everyone loves it. Keep up the recipes coming!